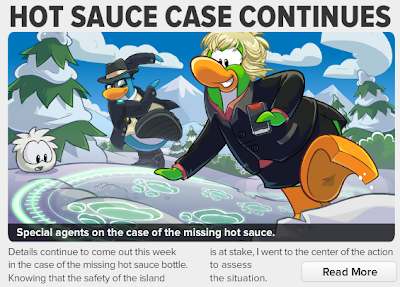 Details continue to come out this week in the case of the missing hot sauce bottle. Knowing that the safety of the island is at stake, I went to the center of the action to assess the situation. The second article in this week's newspaper includes news about secret agents being awarded medals for their hard work in keeping Club Penguin safe! It also includes news about the hot sauce case. "I encourage to to step up to the challenge, your efforts will be rewarded. 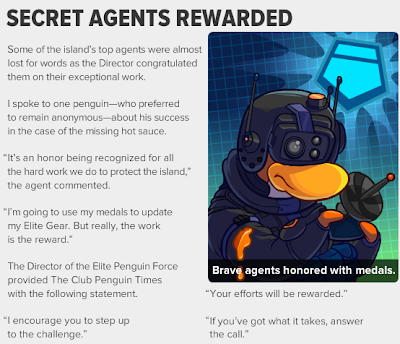 If you've got what it takes, answer the call." On Now -- Igloo Furniture - Igloos just got a little more metropolitan. 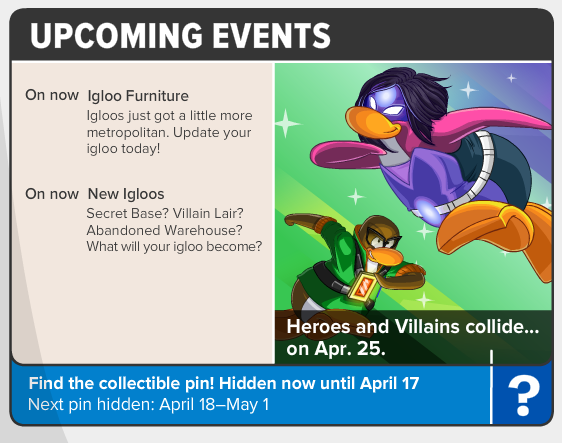 Update your igloo today! On Now -- New Igloos - Secret Base? Villain Lair? Abandoned Warehouse? What will your igloo become? I can't wait for the Superhero party? Which superhero//super villain do you want to be? Leave your comments below.